He was charged with obstruction of justice, according to court documents. Davidson said he had been in the Champaign County Jail before, but this time was different. Instead of being taken to the courthouse for his arraignment and bond proceedings, he was instead taken to a room inside the jail facility with a television monitor and a camera. It was his first experience with video court, he said. “When I first went to the video court, it just blew my mind because I’m watching everybody get up and go in front of the screen, and it’s either ‘yes sir’ or ‘no sir.’ You know you couldn’t say anything,” he said. Davidson, who grew up and spent most of his life in the Urbana-Champaign community, was in and out of the county jail from the 1990s through the 2010s mostly on charges stemming from a heroin addiction. “Most of the times I went to court I was guilty, but this one time I wasn’t,” he said. Davidson believes that had his arraignment been in-person — as opposed to over the video system — he would have “had a better shot.” He believes the judge may have paused the proceedings to listen to his side of the story. After the arraignment and bond hearing, Davidson said a public defender told him a jury would find him guilty because of his criminal background. He said he pleaded guilty to the obstruction of justice charge to avoid more prison time and was sentenced to 18 months in a state correctional facility, according to court documents. With cases like Davidson’s as examples, opponents of video court claim the practice dehumanizes defendants and violates their due process rights, while those who support the use of video court claim it saves taxpayer money and makes the legal process more efficient. There’s scant research published on video court proceedings, but what’s out there indicates the practice is growing. 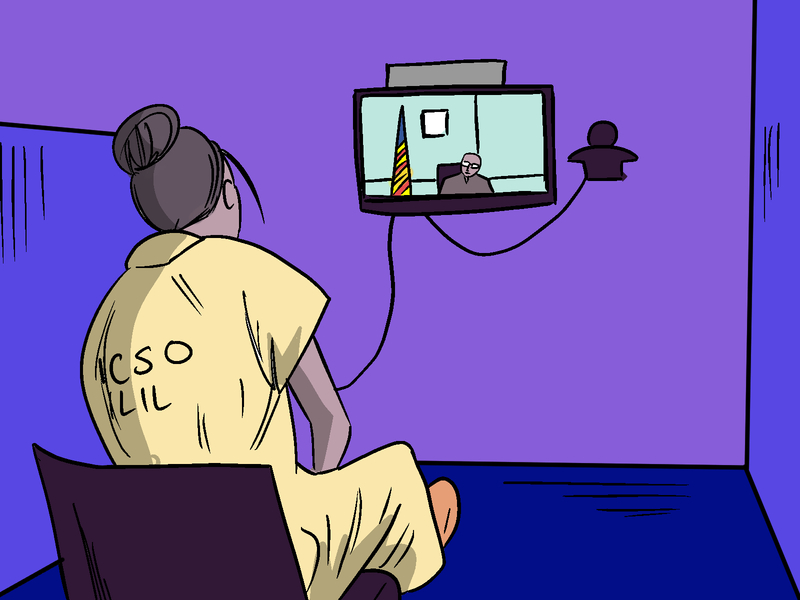 A national 2009 survey from the Pretrial Justice Institute found that 57 percent of counties included in the survey said they used videoconferencing for first appearances. A 2015 research paper funded by the U.S. Department of Justice outlined the potential benefits and drawbacks of the practice. 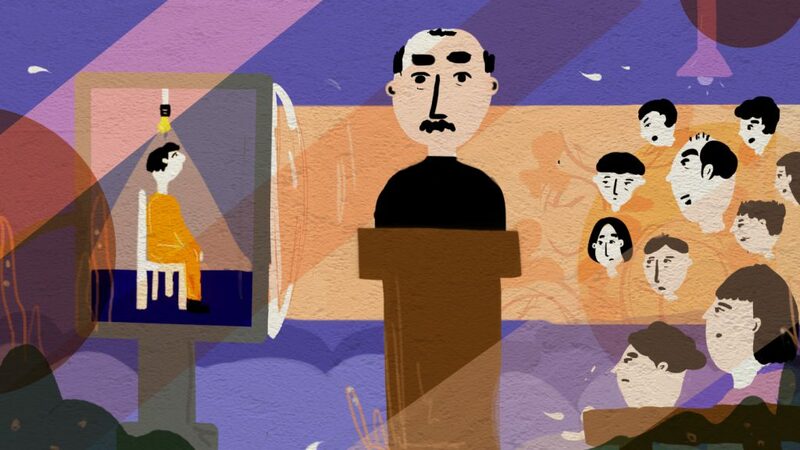 The potential pros of video court include lower transportation costs because inmates do not have to be transferred from jails to courthouses, less staff time involved in those transfers, more security and safety for both the incarcerated and the public, and quicker court proceedings. The potential cons of the practice have more to do with the rights of the incarcerated, including assertions that video court may violate constitutional rights, due process and, in general, dehumanize the accused. Robin Davis, a principal researcher at the consulting firm, ICF, and one of the co-authors of the 2015 study, said she conducted site visits at courthouses around the country that use this technology. “You can have background noise that goes on, and we observed that the judge may mute the jail side. So it’s possible a defendant might want to speak, might want to say something and they don’t hear it because they’re muted. That’s certainly something we observed,” she said. In another instance, Davis said she witnessed an inmate turning to a correctional officer inside the jail facility during a video court hearing to ask what was happening with their case. But in other circumstances, Davis said, video court may mean that someone’s case is reviewed by a judge sooner, and that may lead to a quicker release from custody than if the accused individual had to wait until they could be transferred for an in-person hearing at a courthouse. Sheriff Jeff Standard, of Fulton County — a rural area in west central Illinois — said the practice has benefitted his jurisdiction. Standard said the county implemented a video court system — primarily for first appearances that include arraignments and bond hearings — roughly five years ago at the urging of a judge who has since retired. Standard said the system has saved his county money in the form of staff time. Instead of taking officers off the road so they can transport inmates from the jail to the courthouse half a block away, they can instead watch over inmates inside the jail as they cycle in and out of a small room that contains a TV monitor and a camera. “For a department that has a limited number of resources out on the road as it is, if I can keep them on the road instead of being here to transport between the jail and the courthouse, that’s a huge savings for us,” Standard said. He added the practice also ensures a more safe and secure environment both for the general public and the inmate, who may be targeted by a victim or victim’s family during the transfer between the jail and courthouse. “Now we can take them right in the back, put them in front of the video camera, the judge has access to their video camera and they’re having a conversation just like we are now, but it’s just over a video screen,” Standard said. While more jurisdictions in downstate Illinois are turning to video court to save money and time, a lawsuit halted the practice in Cook County. Locke Bowman, a law professor at Northwestern University and legal director of the MacArthur Justice Center, sued the chief judge of Cook County in 2006 over their use of video court. During these proceedings, Bowman said inmates would be held in the basement of a jail facility in Chicago and told to stand before a video camera while a judge presided over their bail hearings in a courtroom upstairs. “Anyone who cared about criminal justice in Cook County agreed that this process was disturbing. It resembled a cattle call. The hearings would be short and perfunctory. The bond would be set in an inscrutable amount after about 30 seconds of back and forth,” Bowman said. Bowman said the practice “dehumanizes the arrested person.” The use of video court for bond hearings is an especially concerning practice, he said, because those hearings are often the most consequential in a person’s case. It’s the point, he said, when a judge decides essentially whether someone will remain incarcerated or walk free while their case is pending. The suit he filed argued video court violates a person’s due process rights because inmates could not effectively communicate with their attorneys nor the judge. In 2009, Chief Judge of the Cook County Circuit Court, Timothy Evans, voluntarily decided to stop using the video court system, and Bowman said the practice has never resumed in Cook County. Champaign County Circuit Judge Jeffrey Ford said he does not agree with Bowman’s assertions that the practice violates a defendant’s rights and disrespects their humanity. Ford said he was responsible for establishing the county’s video court practices and procedures in the late 1990s. He cited the same pros as Standard, the sheriff in Fulton County, and emphasized the procedure is more efficient, which is a benefit for all involved in criminal proceedings, including the incarcerated. “If you do it right it doesn’t diminish their rights, things will be done quicker and their case may move along faster,” he said. In addition to bond and arraignment hearings, Ford said he hopes the county can begin using video court for more legal proceedings in the future. Davidson, the formerly incarcerated individual, said he can see a potential benefit to video court. He remembers a time when inmates at the jail would be walked to the courthouse in chains and orange jumpsuits. He said it was embarrassing to be out in public like that. Davidson does agree with Standard and Ford on one thing: he believes that despite the drawbacks for the accused, video court is likely to remain a fixture of court systems around the state. 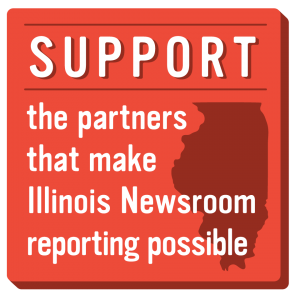 Previous post: Ask The Newsroom: How Are Early Voting And Mail-in Ballots Handled?